Visitors flock to Kure Beach to enjoy the surf, sand, sun and unspoiled paradise, but few of them end up exploring beyond the beach to discover new experiences that are off the beaten path. 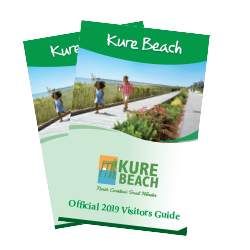 Change your itinerary during your next trip and discover the hidden gems that make Kure Beach North Carolina’s small wonder. Relax on a secluded walk or jog through the trails at Fort Fisher State Recreation Area. With more than five miles of trails meandering from the beach to the sound side, you’re bound to find a spot to call your own. If you’re with a group, enjoy a quiet picnic in the grove of live oak trees twisted and bent from centuries of sea breezes. The North Carolina Aquarium at Fort Fisher is one of Kure Beach’s most popular attractions, but did you know you can go beyond the exhibits and see what happens behind the scenes? Dodge the crowds and make a reservation for a behind the scenes tour to get an insider look at feeding time for the Aquarium’s largest exhibit. Or be an aquarist’s apprentice for the afternoon and get your hands dirty while helping the staff feed and care for the animals. Only visible at low tide is an actual “hidden” gem: the coquina rock formation. This unique structure is host to a rare mossy hard rock outcrop that is cemented together with seashells and coral. Dating back more than 12,000 years ago, these shells have created a natural wonder that is a perfect area to spot marine life like sea stars, hermit crabs and conchs. Adults will love the nostalgia of playing games from their childhood at Hi-Tech Arcade, and kids will love exchanging their tickets for a prize at the end. You’ll find tons of arcade-style redemption games, classic skee ball machines, racing games and more. Away from the hustle and bustle of the beach, only accessible by small boat, canoe or kayak, you will find Zeke’s Island Reserve. This shorebird habitat consists of three islands that boast beautiful natural tidal flats, marshes and dunes. Use the walking trails through the Reserve to see various native shorebirds like great blue herons, dunlin and black-bellied plovers, to name a few, or relax with a good book at the barrier-spit portion of the Reserve. Explore the tanks, helicopters and other military vehicles at the North Carolina Military History Museum. Come face-to-face with artifacts from all branches of service in previous wars at the outdoor exhibits, and get an in-depth look at North Carolina’s military history at the indoor exhibits. The North Carolina Underwater Archeology Branch (UAB) is also located at Fort Fisher State Historic Site at Kure Beach with outdoor exhibits ranging from the prehistoric to the present. The UAB keeps track of more than 5,000 documented shipwrecks.